What do Business Analysis and Entrepreneurship Have in Common? In March, 2014, Cathy Brunsting posted an insightful article In Modern Analyst called “Beyond the Business Analyst Role: What’s Next?” Besides the above options she mentioned Product Owner, Product Manager, and other managerial roles. To me, the product-oriented roles are the most conducive for a BA to use his or her skills to help their organization grow. Both roles take advantage of business knowledge and/or BA-type skills to define, refine, and steer development of new products. Wait a second. Designing and developing new products is what entrepreneurs do, isn’t it? There is more to being an entrepreneur, which I’ll cover in another blog post. But, a critical part of starting a business or line of business is creating a new product or service or one that is better than the market currently has. That is often what business analysts do, and to some extent, project managers too. Entrepreneurs have been around for quite a while. The term was first used in the early 1700s. Classic examples of tech entrepreneurs are Steve Jobs and Mark Zuckerburg. Coco Chanel was a fashion and perfume innovator and entrepreneur in the 20th century. Levi Strauss created the Levi’s jeans company in the 1800s. James Watt was an 18th century entrepreneur. He didn’t invent the steam engine but he innovated several improvements on it. Now that we have some definitions in place, let’s move on to comparing business analysis and entrepreneurship. Product vs. Project vs. Process. Years ago our company put together something we called the “productivity triangle.” Any organization is productive when they create or provide products or services that customers want and need. Creating them is done through projects, and project management is at the core naturally. Re-creating the new product on an ongoing basis is done through processes, which need to be improved or optimized periodically. Process management is central to that and projects may need launching to do the improvement. Underlying both of these disciplines is product management. The easiest part of product management to grasp are the initial requirements and design. Another huge part of product management is developing business cases, which BAs often do at companies. Over time, additional requirements surface and new features are added and can be anywhere from small pieces to large releases. 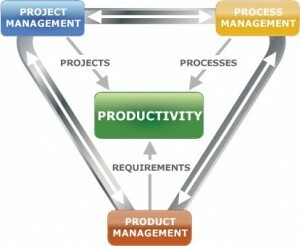 Product management both drives and supports projects and processes, completing the productivity triangle. See Figure 1. Managing processes is the least important for a startup, since it won’t have processes to manage until it starts to “re-create” the products it has built. The other two legs of the triangle are essential for growing a company. Product management skills – which BAs have developed – are essential for starting a company or product. I’m just getting started with the topic and will be delivering a keynote called “The Entrepreneurial BA” at the New Zealand BA Development Day conference in November. Look for additional posts soon!